The professional life of a trial lawyer can be unique because of the variety of the subject matter of his cases. John F. Corrigan was very fortunate to be thrust into situations and cases with a great deal of that variety. He never really knew in advance if he was going to be working on an accounting problem, class action securities cases, contract disputes, land valuation questions, anti trust cases, medical malpractice, doctor's privileges to work in hospitals, personal injury or product liability cases, real estate or title problems, family disputes, or contested trusts or estates. This book tells the stories of some of his experiences in the preparation and trial of these diverse cases in the second half of the twentieth century. Author Biography John F. Corrigan was born in New York. He graduated from the University of Notre Dame in 1953 and from the University of Florida College of Law in 1956. He and Pat married in 1955. They live in Jacksonville Beach, Florida. They have five children, three daughters in law and six grandchildren, all of whom live in Jacksonville. He has practiced law in Jacksonville for over fifty years. 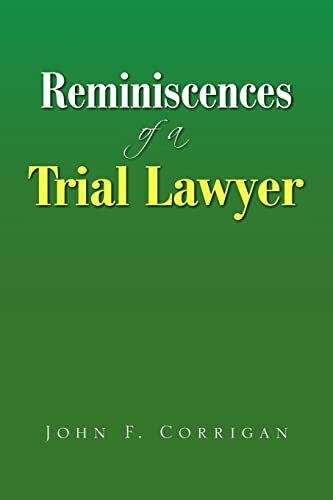 The author has published his recollections about his law practice in a separate book entitled Reminiscenses of a Trial Lawyer.